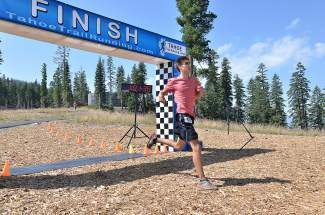 Evan Vomund of Incline Village wins the Squaw Mountain Run on Sunday. Vomund posted a time of 1:01:34 over the 10.6-kilometer course. Find a photo gallery from the run at www.lefrakphotography.com. 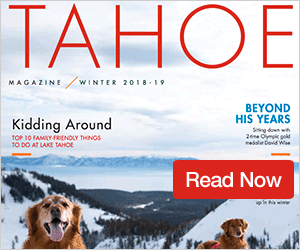 With the way he’s been eating up hills this summer, Evan Vomund’s high school cross-county coach warned that he was a threat to win any given race in the Tahoe area. 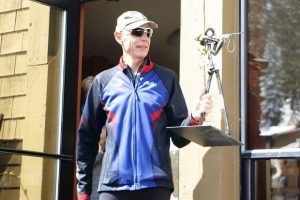 Vomund proved him correct on Sunday, as the 2014 Incline High grad raced to victory in the seventh annual Northstar Mountain Run. Vomund covered the 10.6-kilometer course in a time of 1 hour, 1 minute, 34 seconds. Defending overall champion Kristin Walstad, 42, of Alta chased Vomund to the finish line, placing first among women and second overall with a time of 1:01:42. Seventeen-year-old Elijah Harding of Roakoake finished third with a time of 1:02:10, Truckee’s Jim Telling, 56, was fourth in 1:03:50, and Robert Rosenfeld, 17, of Roanoake was fifth in 1:05:16. 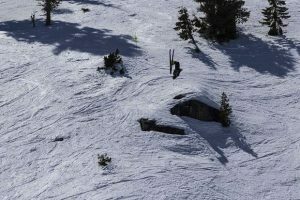 The run — the sixth of 11 events in the Tahoe Trail Running Series — starts in the Village at Northstar and snakes its way up the mountain over Mt. Pluto before finishing in front of the Tahoe Zephyr Lodge. It climbs more than 2,000 vertical feet, beginning at 6,350 feet, topping out at 8,383 feet and ending at 7,894. Dolores Bergmann, 42, of Chester finished second in the women’s field and sixth overall, posting a time of 1:06:07, and Sarah Lyell of Lake Oswego, Ore., was the third woman and 17th overall in 1:13:20. Among other top Tahoe-area finishers, Truckee’s Holden Reed finished 10th in 1:10:13, Scott Montgomery of Truckee was 32nd in 1:21:12, Lindsay Doherty of Crystal Bay was the eighth woman and 33rd overall in 1:21:41, and Jim Kramer of Truckee was 37th in 1:24:18. A total of 97 people reached the finish line. The Tahoe Trail Running Series continues with the Big Blue Trail Run this Saturday and the Marlette 50K on Sunday. Find a photo gallery from the Northstar Mountain Run, and every Big Blue Adventure race, at http://www.lefrakphotography.com.